My record still stands after 25 years, and has just been re-published in the 2013 edition of the Guinness Book of Records. I will forever be grateful to those fine English teachers I had at school – Roger Calvert, Daphne Cooper and Jean Tidy – who between the years that spanned my O-levels and A-levels introduced me to Julius Caesar, Twelfth Night, Antony & Cleopatra, Coriolanus, Measure for Measure and King Lear. From the academic confines of the classroom to the emotional exuberance of the school play, I found my soul simultaneously steeped in dramatic greatness, lyrical beauty and profound wisdom: ineffable, noetic, passive – it was like a religious experience. Every visit I made to Stratford-upon-Avon became a pilgrimage: sometimes wrestling with darkness and devils, and then rejoicing with angels and ministers of grace. The words of Shakespeare have been translated into thousands of languages, from German to Japanese, Hebrew to Hindi, Maori to Yoruba. The Globe even gave us a hip-hop Othello last year as part of the London 2012 ‘Cultural Olympiad’. The Complete Works have inspired more plays, films, paintings, musicals, ballets, operas, overtures and oratorios than any other work of literature, bar the Gospels. In short, Shakespeare cannot be bound in a nutshell – national or continental. He crammed into his ‘wooden O’ a universe of divine reasoning and the whole world of human passion. So it irks somewhat to learn that a group of academics is seeking to persuade the European Parliament to adopt Shakespeare as its ‘European laureate’ in time for the 2016 anniversary. So keen are they to promote him as a ‘shared cultural heritage’ that a European Shakespeare Ode is to be commissioned after the fashion of the 18th-century Garrick Ode, by which the most famous actor of generation rekindled the nation’s interest in Shakespeare’s writings. Poetry by committee is not likely to have the enduring potential of Garrick’s individual creation. But the EU has a habit of appropriating odes for political purposes – just look what they’ve done with Schiller (via Beethoven). According to Professor Ewan Fernie of Birmingham University, Shakespeare is ‘intimately important in European culture, not just as somebody or something for Stratford and not just for self-congratulatory English patriotism’. While this is undoubtedly true, there’s a rather predictable academic sneer in that ‘self-congratulatory English patriotism’. Shakespeare wrote of England and the English (people and language) no fewer than 422 times: he mentions Europe just 10 (or 11 if you include a conflation with the goddess Europa). He waxes eloquently of England’s kings and crown, of the superiority of the English court, and of the English and their nobility, honour, valour and soul. And it isn’t some superficial patriotic pageant: he holds a mirror up to our nature, one time mocking and then lauding the national psyche. The England of King John that ‘never did, nor never shall, / Lie at the proud foot of a conqueror’ is that same country where Hamlet is told ‘the men are as mad as he’. But God forbid that the English might now actually find anything to celebrate about England in any of this. And should they myopically and unintelligently do so, it cannot possibly be without a whiff of conceited nationalism. 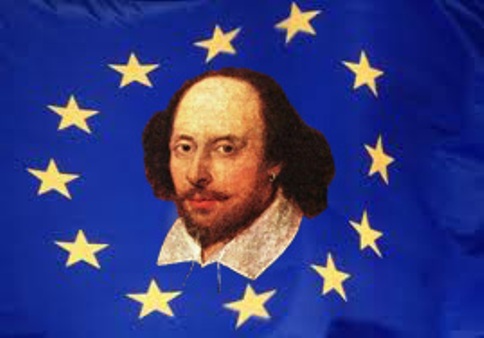 No, like our agriculture, fisheries and airspace, Shakespeare is set to become a ‘common European resource’, as decreed by the European Parliament (courtesy of a lavish grant by the taxpayer). Like our foreign and security policy, he is to be forever moderated and muted in the cause of human rights. Like our sovereignty, the Bard is to be ‘pooled’ under the aegis of redacted Euro-citizenship. In this age of moral relativism, logical positivism and the equality of all religions and beliefs, Christianity is obviously no longer able to constitute the soul of Europe. So it falls to the spirit of Shakespeare as the chosen medium by which Europe’s ‘great cultural tradition’ will be promoted and the people evangelised. And no doubt all those who baulk at this manipulated pan-European inculturisation will be cast as swivel-eyed bigots, right-wing Europhobes and narrow-minded little Englanders. Funny, isn’t it, how those Euro-enthusiasts who so disparage any hint of ‘self-congratulatory English patriotism’ in Shakespeare have no problem at all imposing their own political egos on the text, supplanting the Cross of St George with the flag of the European Union, and appropriating his manifestly universal genius for their own self-congratulatory Euro-nationalism. This entry was posted in Shakespeare and tagged Beethoven, Christianity, Culture, Education, Equality, EU, European Parliament, Globe Theatre, Guinness Book of Records, Ode to Joy, Patriotism, Relativism, Shakespeare, Stratford-upon-Avon, Teaching by Adrian Hilton. Bookmark the permalink. Perhaps it should be pointed out to he good professor and other “useful fools” of the EU that it is, by its creators own admissions, a rework of the first Frankish (Holy Roman) Empire that was still extant during the Bards lifetime and that the aim of many of its constituent parts (eg Spain France not to mention the Roman Church itself ) at that time was the conquest of heretic England! Plus ca change? It should also be pointed out that large swathes of the English population are descended from Saxons and Normans none of whome were ever members of that empire before fleeing from its naked early medieval ambitions and that England was also a safe haven for Huguenot refugees from that area round about the time of the Bard! So where is the Euro connection? Agree. It doesn’t make sense to see Europeans glorify Shakespeare who had nothing to do with unification or revolution. Based on the plays, he was a highly skilled aristocrat who certainly never backed the rebel. In fact, he always made them comic relief – the great drama always the flawed nobility. Shakespeare loved the courtier, poetically, and one should never equate his soul to the common cause. The well off of his Age supported the arts, and Shakespeare traveled Europe to do just that, and sent back almost a dozen plays to Elizabeth I about everything beautiful. The common man remained a laugh, and not beautiful. How charming now to treasure nobility! Sorry but I’m really shocked or perhaps not about this. They’ve taken everything else so why not Shakespeare and Milton – and let them have Vaughn Williams and Edward Elgar too while they’re at it. What’s left of ENGLISH culture if everything is merged into EUROMESS. I think it’s fine. Shakespeare’s work have long been called “the secular scriptures”; I think it is thoroughly appropriate that his works replace the Bible as the textual basis of European culture. Or, in the long run, world culture, for that matter. If Anglocentrism is giving way to Eurocentrism, isn’t it just a natural step in the evolution towards universal humanocentrism? And besides, I think there is reason to believe that Shakespeare *intended* his works to be the equivalent of a secular bible for Western culture – but this, of course, is a highly controversial view. Professor Ewan Fernie (BA Edinburgh, PhD St Andrews) wouldn’t be a Scot would he? It might have been more cirucmspect for him to have put the full stop after “Stratford” and to leave out “and not just for self-congratulatory English patriotism”. Just a thought. Thanks for your comment. You make a very interesting point – except that Shakespeare’s works are far from ‘secular’. They are steeped in Scripture, and he was clearly influenced by the great themes of the Bible. I’d go as far as to say that his mind was permeated with divine truth. Just one example – in Sonnet CXLVI he reflects on his sin, spiritual warfare and the transience of this life. There is, with respect, nothing ‘secular’ about him. I like the idea! But as a Brazilian, I’d like Shakespeare represented the West as a whole. For now is good.